I have ended up with some free time, so I thought I could be constructive with my time (bad pun intended). Recently I was watching Ask This Old House and they had a really nice garage storage unit that included adjustable shelves and peg board for door inserts. I found the episode listed on their website but they did not include any plans or sketches. Only one small picture and my inaccurate memory. I wanted to do something very similar with some alterations. I wanted the cabinet to be 14″ deep total which will fit nicely above my work bench. I wanted to use shelf pins which I have a fantastic router jig for. Lastly, they did not use dados for the fixed shelves, and I thought that might be a better design. I liked the peg board panel based doors so I decided to do that as well. My design is pretty simple. A 3/4″ plywood box with a fixed vertical support in the middle. The dimensions will be about 48″ wide x 32″ high x 14″ deep. That depth does not include the doors. Now it was time to cut up some plywood! I used the bed of my pickup as my plywood cutting station. It is just at 100 here in Austin, so I think my next project will be to build a plywood cutting center. 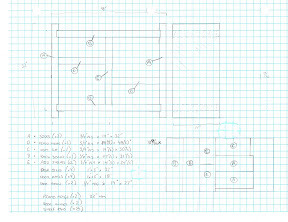 In plans I marked some of the plywood pieces as being 14″(s) meaning they should be short of 14″ to take in account the 1/2″ plywood. As you know 1/2″ plywood does not measure 1/2″. In this case it measures 7/16″. So all of my 14″(s) pieces are actually 13 9/16″. This is all of the pieces cut to width. The left and right panels are also cut to length but the rest will need to be trimmed to fit. The final step for the day was to setup my dado jig. I have a set of plywood router bits where the 3/4″ bit is actually 22/32″. I wanted the dado to be just about 1/4″ deep so I set my plunge router to that and fit the straight edge guide. I intentionally made the first dado deep in on a scrap piece do I could do multiple passes if needed. Turns out the depth is great and the fit is excellent. I then set the guide to be much closer to the end of my sample board – just about the width of a metal ruler I have on hand and ran a 2nd dado pass. This will be where the dados are on the project.